See how MisterChill can supply quality ice making bar equipment. MisterChill's bar equipment, coolers and ice making machines are all brand new. Once you place an order, we deliver directly to your door. All of our bar equipment comes complete with a full, 24 months parts warranty. Our prices are extremely low - this is because we don't, and won't, add any expensive extras onto your bill. We buy in bulk and pass the savings on to you. This means we don't sell you any unnecessary extended warranties because all the machines we offer are robust and strong. We don't even charge you expensive installation fees, but if you do need help installing any equipment, full instructions are downloadable from our site. 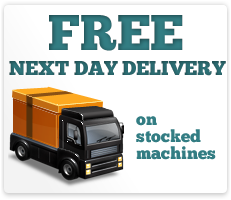 We deliver directly to your door, normally within 5 working days within mainland UK. Quite simply, there isn't an easier or more efficient way to buy bar equipment online.